Another breakfast recipe! Oats! Again! 🙂 You see, the whole of last month I was missing in action due to the revamping of my website. I had to wait patiently without posting a single recipe but my kitchen was as busy as ever. I tried out a ton of recipes and I am ever so eager to share them with you. Well, I am not the one who generally likes to post back to back recipes that belong to the same category I couldn’t resist as the mango season that is upon us won’t last forever. 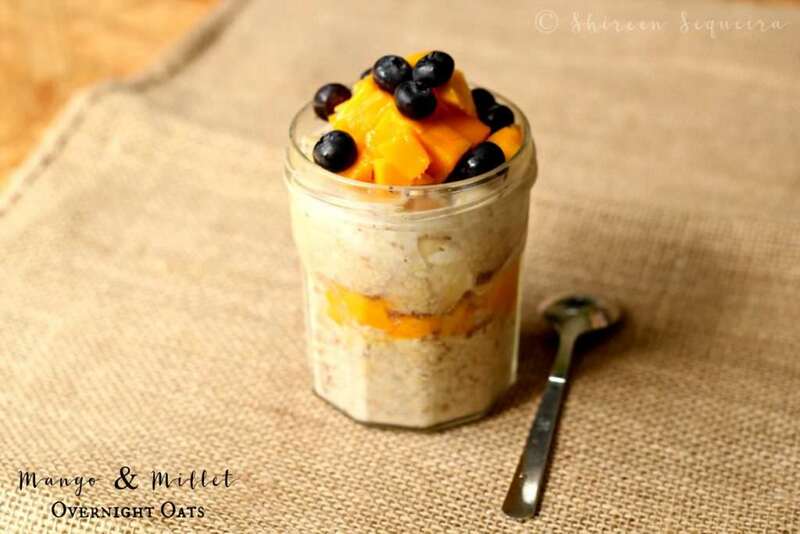 I made the overnight oats quite a few times last month, mostly to satiate our sweet tooth. Trust me, it makes for a great guilt-free (well almost) dessert option. I am not the type who likes to start the day with cold breakfast, I like to warm up even the milk on my cornflakes on the rare occasions that I eat them. However, since I have married someone who loves adding chilled milk to his porridge or eats fruits for breakfast that were chilling overnight so it wasn’t hard for me to figure that he would love the overnight oats as well. He enjoyed them for breakfast on some days while on others, he had it as a 3 p.m. dessert/snack. Believe me, even I loved it as a dessert. The good part about this recipe is that there is no added sugar and vegans can substitute the honey with maple syrup or dates syrup & the milk with any dairy free milk like coconut, almond, cashew or soy. 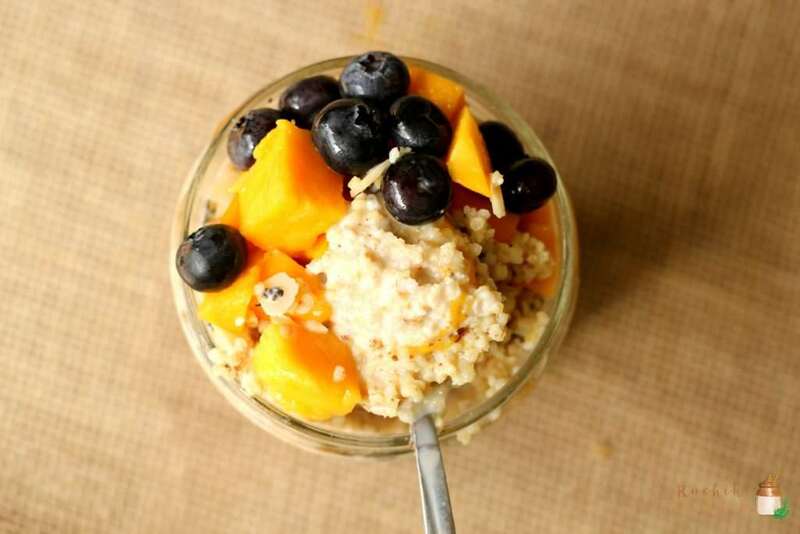 I know that overnight oats are a rage currently and everyone is making them. I generally don’t fall for fads but then I decided that I had to try it in order to find out what the hullabaloo was all about. I am so glad that I broke out of my preconceived notion that it was just another fad. Overnight oats is here to stay, at least at my place. The prime reason being – the ease of putting it together. This is something even a child can do and works wonderfully for busy folks who don’t want to wake up in the morning and wonder what to make for breakfast. Honestly, it doesn’t take too many ingredients either cuz it’s all about layering oats, fruit and some milk. Throw in your favourite ingredient that needs no cooking – bananas, chocolate chips, peanut butter – seriously, anything you fancy. The reason why I added millets was because I was experimenting with them that day and decided to add them to see how they fared and plus, mangoes are reigning supreme in my house. I only wish I had taken shots of the jar before I refrigerated it as the layers were pretty evident. Once the milk begins to seep in and the oats soaks it up its a different scene altogether. What you see are pictures shot the next day, just before I served it. Better pictures next time, I promise! An easy, no cook recipe for oatmeal that just got an extra dose of health with the addition of millets. Layer it, refrigerate it and let the oats soak up the goodness before it gets ready for your breakfast the next morning! This recipe works great to curb those early evening hunger pangs too! Bring a little less than 1/2 cup of water to a boil in a small saucepan. Wash the millets (see notes) and add to the water and let it boil for half a minute. Turn off the heat and cover the pan. Leave the pan undisturbed for 15 minutes, then open, stir in the honey and keep aside to cool. 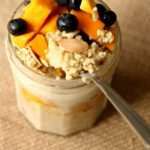 Layer a bowl or a clean jam jar (or mason jar) with the cooked millets, sliced bananas, oats, mangoes and sprinkle the flaxseed powder & basil seeds on top. Serve chilled for breakfast or as a guilt free dessert! Thanks so much Coral! I hope you enjoy making this quick breakfast! Shireen I have been trying out your recipes and find them excellent. Tried the overnight millet oats, and since I dont eat mangoes I substituted it for bananas. Also I added a pinch of cinnamon powder. It was relishing and I wanted to make another bowl. I may do that tomorrow with a change in fruit and may add some dryfruits to it. Thanks for the easy, lovely recipe. Thanks a lot for your lovely comment! 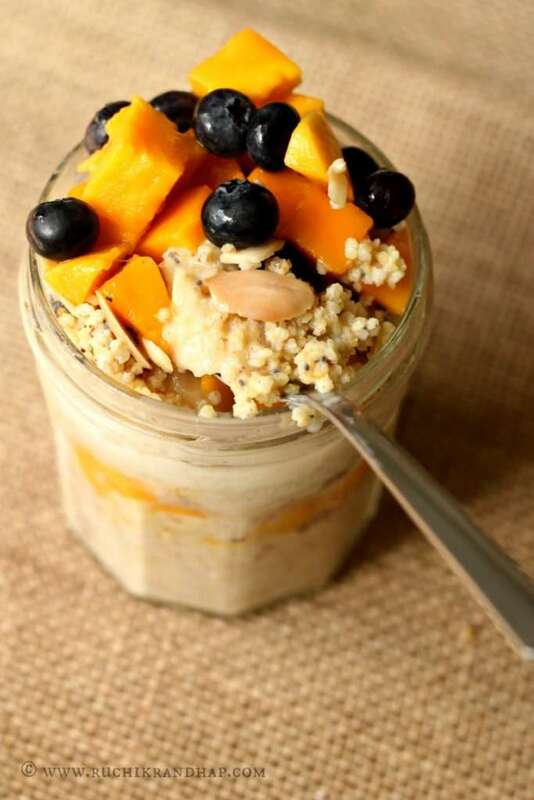 I am so glad that you enjoyed the overnight oats! I will add cinnamon next time!